"If I disrespected you, Lauren London, in any shape or form, I'm sorry, even though I didn't," Kodak said Saturday. London has not responded to Kodak's comments. Hussle, 33, was fatally shot outside his clothing store in Los Angeles' Hyde Park neighborhood last Sunday afternoon. Two other men were wounded. The Grammy-nominated rapper, born Ermias Asghedom, was a beloved figure both in his native South Los Angeles and in the hip-hop community. His store has been transformed into a makeshift memorial by mourners. 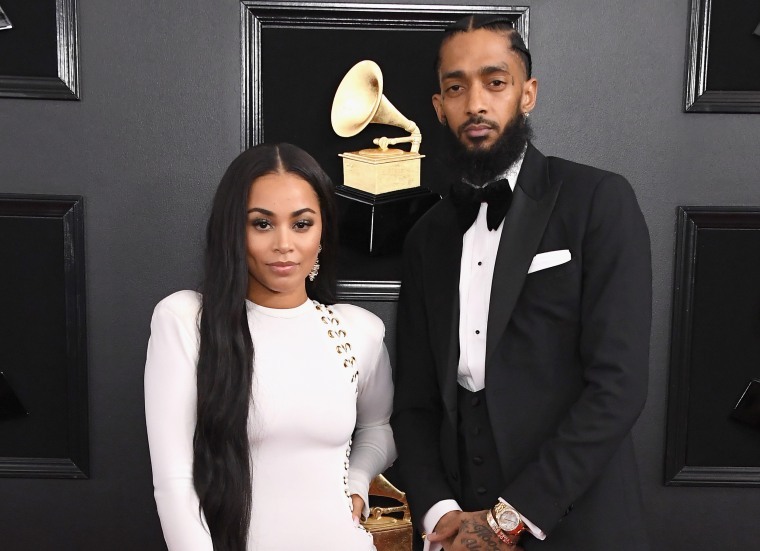 London, an actress and model, paid tribute to Hussle on Tuesday in an Instagram post that featured images of the rapper and their family. "I am completely lost," she wrote. "I’ve lost my best friend, my sanctuary my protector my soul ... I’m lost without you. We are lost without you babe. I have no words." On Thursday, prosecutors charged the suspected gunman, Eric R. Holder Jr., 29, with one count of murder, two counts of attempted murder and one count of possession of a firearm by a felon. He pleaded not guilty to the charges.